Highway Games is proud to announce that Ocean King, the premium fish hunting redemption game from IGS, is under their exclusive agency in the United States and Europe and will be made available in November, 2013. 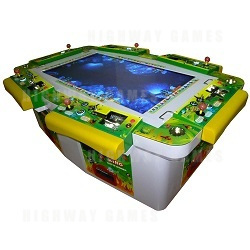 Since the first video redemption, fish-catching cabinet hit the amusement market they have been a smash hit with players all across the globe and IGS has an extensive history of success in this area with its Fish Hunter line, which the Ocean King continues to improve and build upon. The Ocean King is the biggest and most diverse cabinet in the line-up yet. With a 55 inch high resolution LCD display, superb 3D graphics on the ocean scenery, more input and output options than ever before, and room for two extra players this cabinet is a must-have addition to any game center or FEC. Not to mention, the cabinet has a variety of customization options for operators to tailor to their specific location. The simple concept is offset by fast, exciting gameplay that demands quick thinking, skill and co-ordination. With the Ocean King, up to 8 players can go head-to-head in a race against each other to catch as many and more profitable fish as possible to score points and get the biggest payout! The game also has a range of fun features to keep players interested, such as the new Cumulative Super Gun, which is one of three players can use, and 16 types of fish to catch with four totally new species - including the Ocean King addition, the Humpback Whale. There are also three exciting mini games that will surprise players such as the Bomb Crab, the Twister and Chain Thunder! The mini games create more competitive gameplay by integrating with the main game and players of all ages will get hours of entertainment out of the Ocean King. The Ocean King is available as a six player or eight player deluxe machine and is customised for your location – it is available with coin/token mechanisms with optional note acceptor, and output can be set as redemption tickets, coin/token, or thermal printouts. For more information on the Ocean King, please visit www.highwaygames.com.